We live in a world which is generally disagreeable, where not only people but the established powers have a stake in transmitting sad affects to us. Sadness, sad affects are all those which reduce our power to act. The established powers need our sadness to make us slaves. The tyrant, the priest, the captors need to persuade us that life is hard and a burden. The powers that be need to repress us no less than to make us anxious . . . to administer and organize our intimate little fears. My primary concern in this essay is not with the displacement of cinema by other media technologies, nor with a theory of affect as distinctive to these new media. Rather, I am interested in discussing Haneke’s Code Unknown (2000) as an instance of cinema’s attuned interface with the affective climate of our time—cinema as a technologically fluid medium that registers the violent affects relevant to the socioeconomic conditions of life in the 21st century with a particularly strong political and ethical force. This entails not so much a view of cinema as a discrete, self-contained medium, hence a break between the cinema and more recent image technologies—as suggested in the notion of the post-cinematic—as an interest in stressing the continuities found in the uneven, differential becomings of the image across a diversity of media. From this angle, what matters is not the disappearance of cinema, but its ongoing transformation by all manner of political, cultural, or technological becomings. It is beyond the scope of this essay to engage with Steven Shaviro’s Post-Cinematic Affect with any degree of specificity. 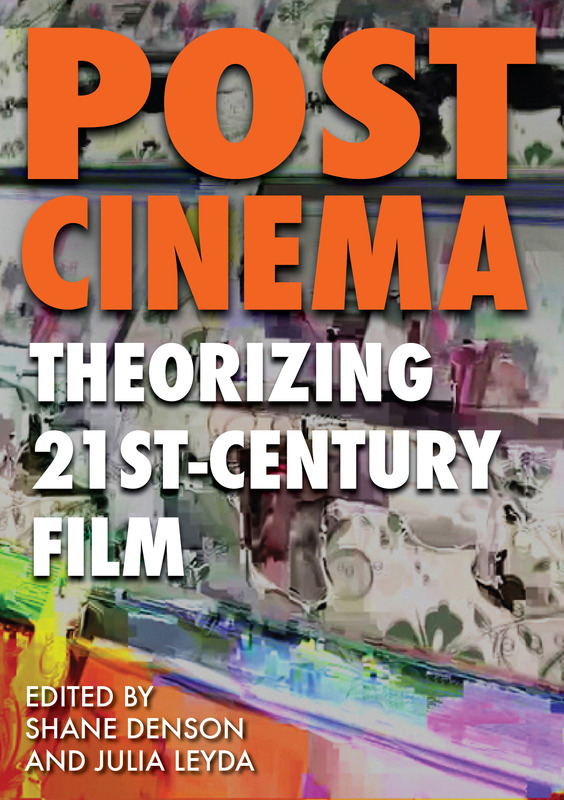 However, I trust that the apparent points of departure between Shaviro’s concept of post-cinematic affect and my own analysis will be conducive to a productive tension and debate regarding the intersection between media, affect, and politics. In this regard, in contrast with Shaviro’s insistence on the totalized subsumption of affect under global capitalism, or, as he puts it, “the continuous transformation of affect into currency” (62), I will be arguing that affects in Code Unknown function in a double modality, simultaneously as effects of biopolitical subjection and expressions that exceed biopolitical calculation. Haneke’s film is an example of such a double movement, on the one hand drawing attention to forces that drain life out of bodies, while on the other hand keeping an eye on the aesthetic and affective mechanisms that become politically relevant in their ability to replenish the life forces thus drained. Code Unknown resists biopolitical violence by investing in the incalculability of affective life, and it is this orientation that allows the film to avoid implications of abject despair or cynicism. Theoretically, my analysis of Code Unknown will be positioned between the affirmative potentialities of a Deleuzian/Spinozist ethology of the affects and Agamben’s diagnosis of the biopolitical reduction of the human to “bare life”—a term that designates the concept of life as expendable matter subject to the sovereign and arbitrary law of the state. This discussion of Code Unknown will extrapolate the concept of bare life from its original theoretical context, the Nazi extermination camp, and into the contemporary metropolis in order to account for the ways in which every subject in today’s societies of control is susceptible to embodying the condition of bare life. The instrumentalization of life pursued by biopolitics is carried out today in close alliance with the aims and procedures of capitalism. Through this alliance between biopolitics and capitalism, life is managed and contained within a series of socioeconomic functions that are purportedly meant to enhance and improve life for all. In intimate collusion with capitalism, biopolitics carries out the public organization of the life process, and, as such, it is inherently violent in its intersection with the realms of necessity and survival. As we shall see, this merging of the realm of politics with the biological realm of necessity and survival is crucial to the way Code Unknown stages the chaotic encounters of bodies in the metropolis. One of the central ways in which Haneke’s cinema expresses the violent affective becomings of our time is through a general disarray of the mechanisms of both language/communication and consciousness. But, in itself, this disarray is not a sign of a new modality of cinema exclusive to our most recent times. Looking at the becomings of cinema after WWII, Deleuze’s philosophy of the time-image already takes into account such a state of affairs, as it addresses the inability of modern cinema to respond to new affective pressures with the failing models of classical psychology and clichéd emotion, while at the same time underscoring cinema’s capacity to generate new perceptual and aesthetic responses to these pressures. Rather, what makes Haneke’s Code Unknown vibrate absolutely in sync with our time is its bringing to light the affective dimensions of biopolitical violence as it is exercised in response to the aims and procedures of both post-industrial capitalism and control societies. As one of the most avowedly political films in Haneke’s filmography, Code Unknown performs what I would call an “activism of affection.” The exhaustive public organization of life processes and the instantaneous capture of subjects by biopower are balanced out and complicated in this film with a nuanced accounting of vital affective forces whose coding remains imprecise or altogether unknown. Code Unknown thus takes Deleuze at his word when in his commentary on Foucault’s vitalism he writes that “life becomes resistance to power when power takes life as its object . . . When power becomes bio-power, resistance becomes the power of life, a vital power that cannot be confined within species, environment or the paths of a particular diagram” (Foucault 77). 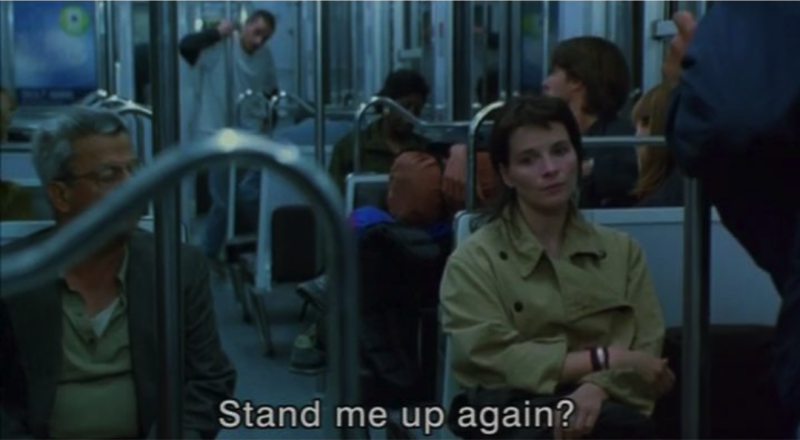 In Code Unknown, Anne (Juliette Binoche) is an actress living in Paris with her photojournalist boyfriend Georges (Thierry Neuvic) in a modest apartment on the Boulevard Saint Germain. Early in the film, Georges’s brother Jean (Alexandre Hamidi) suddenly shows up in Paris in an attempt to escape the life of rural farming his father intends for him. Anne finds Jean in the street unable to enter her apartment building because her door code has changed. As Anne shares her new code with Jean, this early moment signals forward to one of several events intertwined in the film’s final scene. In this scene, Georges comes back from one of his war reporting assignments to find that he cannot enter the building where he and Anne live because apparently she has once more changed the code in his absence. In a long shot, we see Georges trying to call Anne from a public phone, and, although the camera keeps us rather distant, we realize that she is denying Georges access to the apartment. With these all-too-familiar scenarios strategically placed at the beginning and end of the film, Code Unknown draws our attention to what is arguably one of its most important concerns—the extent to which our access to goods, services, rights, economic and financial resources, and even to each other’s intimate spaces, in today’s societies of control is managed and regulated by the pervasive use of passwords or codes. Examples of this supervised access in the film are numerous, but the moments just described are significant for bringing together two different fields of coding, thus making “private business pass into the political, and political affairs into the private,” as Deleuze suggests. I am referring to the social forms of coding/overcoding that stratify the circulation and exchange of flows of capital, goods, labor, or people in the social field, versus the potentially more fluid, less segmentarized codes of affective exchange that are the basis for many of our relations and interactions with others. As Haneke’s film makes clear, these two forms of coding are no longer segregated. As Anne alternately gives or denies someone knowledge of her door code, she is allowing access to her intimacy or restricting such access by partaking in one of the most effective regulating mechanisms of control societies: the establishing of thresholds “through which one can only pass with the right password” (Patton 96). Code Unknown seems to be acutely aware of the transition Western capitalist societies have undergone from the diagram of disciplinary power to a diagram of control. Whereas the regime of discipline relied on physical mechanisms of confinement and punishment, a diagram of control administers lives and regulates actions through less visible, yet more insidious and ubiquitous means. As Paul Patton remarks, “control makes use of pass-words rather than order-words” (96) or commands; it “operates in the open air rather than in confined spaces, by means of various digital and electronic technologies” (96). If in the private sphere of Anne’s life the use of a password can either facilitate or prevent someone’s access to her actual or virtual space, in the socio-economic and political sphere passwords become key in determining inclusion or exclusion from the right to access various economic and cultural resources, or even political/juridical privileges. Through the intermingling of divergent narratives, which ultimately uncover more affinities than disparities in the lives of French citizens and of Eastern European and African immigrants, Haneke’s film is concerned with developing a two-dimensional notion of the code. First, the film, as already mentioned, insists on the pervasiveness of social overcoding mechanisms and their deleterious effects on bodies that are excluded from socio-economic and political exchange; second, and even more crucially, the film contrasts such codes of regulation with what I would call “codes of passage”—codes that open a channel of circulation and possibility where one’s power to affect, and be affected by, others can enter into a relation of exchange with the forces of others. The restrictive, stratifying functions of codes, the film seems to suggest, should be softened by attempts to mobilize the code towards non-stratifying functions of open interaction and inclusion. With its emphasis on the way codes impact lives, Code Unknown stages a confrontation between political forces and life forces—their difference as well as their inextricable interdependence. 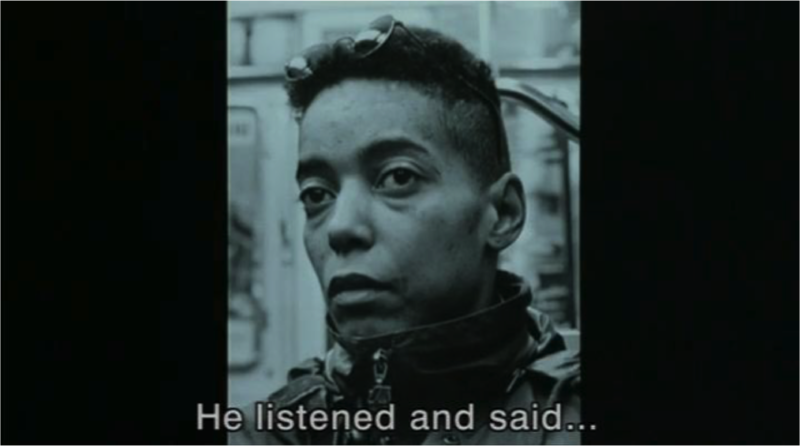 While the film is undeniably invested in showing the subsumption of life under biopolitical control, it simultaneously offsets this trend in two ways: first, by countering the controlling forces of biopower with a minute dissection of the incalculable affective forces that we see at play in the volatile encounters between individuals of diverse backgrounds, ages, genders, and ethnicities; and second, by drawing the unlikely points of contact, and indeed the biopolitical proximity, between the lives of French citizens, which the sovereign power of the state seems at the outset to recognize as valuable, and the lives of Eastern European and African immigrants, which biopower situates within or in the vicinity of bare life. The snapshot of contemporary Europe provided in Code Unknown reveals that the power of language as both a repressive and a creative code has run its course. Language is thus emptied out and surpassed by other codes that prove more effective not only as state tools for managing flows of populations and labor, as well as lifestyles, but also as emergent new ways for initiating expressive and creative contacts and for building communities and possible worlds with others. In their sensibility to a new code of exchange, the opening and closing scenes framing Code Unknown instantiate Haneke’s intuitive grasp of the present cultural and historical zeitgeist. In each of these scenes, taking place at a school for hearing-impaired children, a child utilizes gestural language to perform an affect that the other children in the audience are supposed to guess and name. In the opening scene, the girl’s gestures and movements of fear and withdrawal (See Figure 1. A girl performs the gestures of fear and withdrawal) are met with the following guesses: “Alone? Hiding place? Gangster? Bad Conscience? Sad? Imprisoned?” In reply to each of these guesses, the girl performer shakes her head. But the children’s failure to decipher her affective code may be read as an asset rather than an actual failure. Two things point to this possibility: first, the time and careful attention the children in the audience give to the performer indicates a genuine interest in the other; second, the very multiplicity of responses and their failure to coalesce into a single name or answer is itself indicative of the incapacity of linguistic codes to translate affects that are transformative and heterogeneous. As such, this apparent failure in translation is rather a sign of the inexhaustible, altogether unmanageable powers of affective life. What matters here is the incommensurability between the affect performed—a composite of several interrelated affects—and the linguistic codes of fixation and stratification. The challenge this ambiguity poses to our attempt to access or to know the other constitutes a political affirmation of difference, a manifestation of life’s resistance against power that the film overall seems intent on stressing. Haneke’s cinema allows us to see and experience an unprecedented speed of affective becomings. Affects unfold here as complex clusters of varying intensities of emotions that are constantly on the move to becoming different from what they are at any single point. Code Unknown makes note of this affective complexity and volatility in multiple instances, thus pointing to the segregation of violent and non-violent moments as a purely artificial, arbitrary gesture (Coulthard, “Interrogating the Obscene” 180). By considering the affective excess that lingers well after a conspicuously violent encounter has taken place, we can grasp the wild singularities involved in violent forces in absolute defiance of representational containment. It is, for example, at the apparently inconsequential moment when Anne surfaces on the street after being harassed by the young Arab man in the subway, and she walks home, that the affective turmoil of her encounter has a chance to sediment and become visible (See Figure 2. Anne comes out on to the street after being harassed in the subway). And it is also at this point that her facial and corporeal expressions defy any analytic attempt to stratify her affective experience. A multitude of affects guide the movements of her head, the subtle mistrust in the turns of her gaze towards one side of the street and the other, her tentative walk. Yet, no single signifier can capture the affective complexity brewing in the movements and speeds of her body. Two other scenes in Code Unknown are exceptionally expressive in the way they signal to the correlation between the contemporary breakdown of language—its failure to deliver transparent communication and to produce civilized community—and the exposure of a raw affective layer that refuses any form of coding, hence is marked as unknowable or unknown. In the first of these scenes, Jean and his father (Josef Bierbichler) are having a dinner of beets at their farm. Except for the father’s sad words (“That’s all there is”), father and son eat and go about their business in total silence. After the father finishes eating and washes his plate in the sink, he shuts himself in the bathroom, and then flushes the toilet to pretend that he’s there for a purpose other than simply hiding his misery from his son. As in a later scene where father and son are relentlessly toiling in the barn together in total silence, the lack of speech contributes to the impenetrability of the affects that pass between them. The simple actions they perform—eating, washing, doing hard physical work—are anything but simple or obvious. What the film gives us to feel is immanent to the actions performed, yet it is well beyond what can be articulated in language. 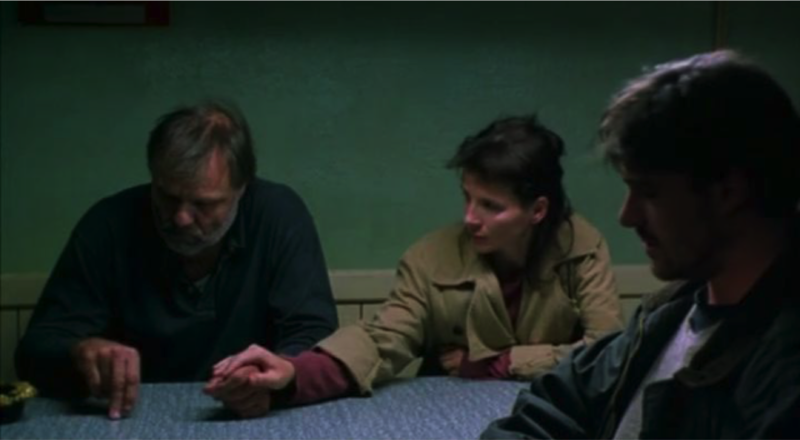 In a way that profoundly marks Code Unknown as an accurate ethological chart of the contemporary human situation, some of the characters in the film occupy a no man’s land where former codes of exchange such as language have outlived their relevance, and where the emerging affective codes only serve to magnify their vulnerability. Georges and Jean’s father offers a primary example of such a disempowered position, having no secure foothold in either the traditional/molar modalities of authority (fatherhood, property [it appears that he kills his own cattle in a desperate gesture], assertiveness through language, etc. ), nor in the emergent, less stratified forms of contact and relation. His inability to affectively interact with others is made painfully obvious in the scene where Georges and Anne come to visit him at the farm. On this occasion, the father’s speech traverses several conflicting emotions, going from disappointment and anger at Jean’s unexplained departure from the farm (“I thought that he’d be married soon and so he’d have a house ready to live in”), to resignation (“In any case, he’s right. There’s no future here”), and recrimination of Georges for setting a bad example for Jean (“You blazed the trail for him”). Finally, the father reaches a dead-end where what he really feels cannot be articulated: “Jean will come back when he wants to, or. . .” to which Georges replies: “Or what?” As language utterly abandons the father, he starts to fidget nervously with his fingers on the tabletop. But when Anne affectionately steps in to hold his hand steady, he cannot handle her touch, excuses himself, and leaves the room (See Figure 3. Anne tries to hold Georges’s father’s hand). On a larger geopolitical scale, and through an array of characters variously positioned in relation to the center of Western European culture, Code Unknown reflects on the search for identity in the European nation states as fueled by the obsessive exclusionary dynamics of biopower. That is, the film shows how all individuals, included and excluded alike, are affected by the controlling mechanisms at work in the European Union’s quest for economic and political unity in the face of increasing flows of immigrant labor crossing its borders. It also more importantly reveals the affective consequences of such bureaucratized violence. 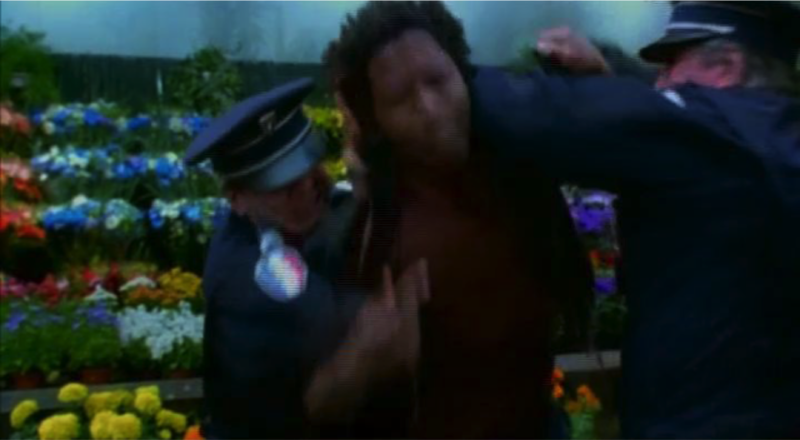 The film’s first narrative segment submits four people (Anne, Jean, Amadou, and Maria) to a violent affective collision where not only do they confront each other’s immediately politicized forces, but they also confront the forces of the state/police summoned to restore order. After Anne meets Jean in the street on her way to work and gives him the code to her apartment, Jean walks past Maria (Luminita Gheorghiu) begging on the street corner and distractedly discards some wrapping paper onto her lap (See Figure 4, above). Amadou (Ona Lu Yenke) happens to take note of Jean’s action and demands some form of apology or remorse from him. An immigrant himself like Maria, yet not nearly as destitute, Amadou takes on the passionate advocacy of her rights, thereby asserting himself against Jean’s white, Eurocentric privilege. 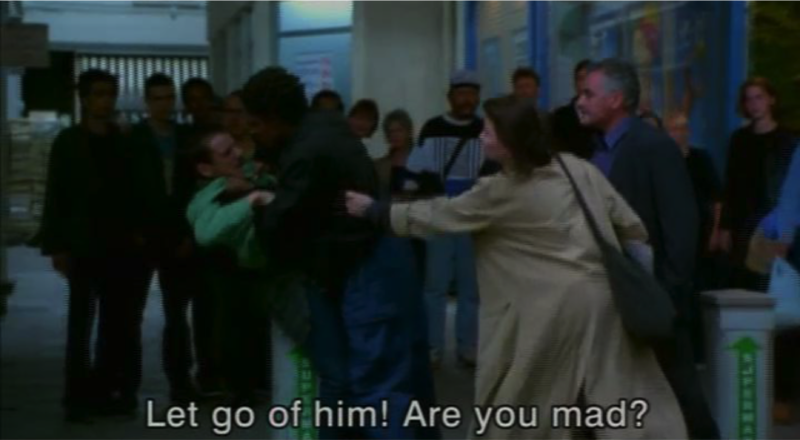 As Jean persists in walking away from Amadou and ignoring his pleas for an apology, the two young men engage in a rather violent physical fight (See Figure 5, below). Amadou’s awareness of his own racial difference vis-à-vis Jean prompts him to explain to the gathering crowd that Jean has humiliated the lady. 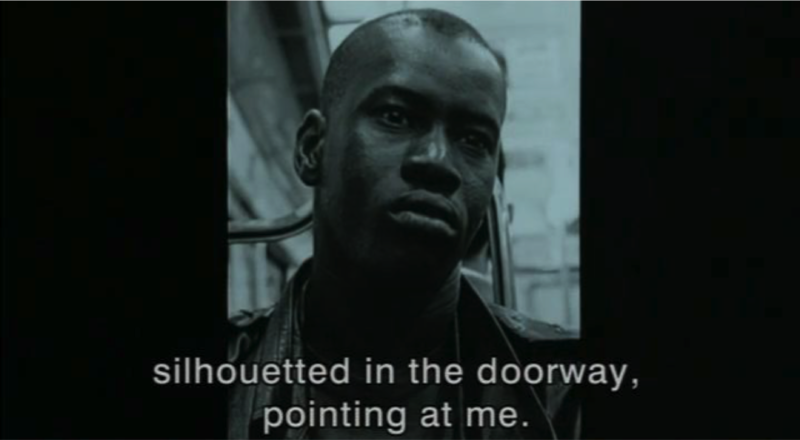 Amadou’s belief in the possibility of recovering the truth of the incident and of transparently reenacting it for their street audience unremittingly continues when the cops show up and he attempts to explain the simple facts of the event as he saw them (“he humiliated a woman begging outside the bakery”). Upon arriving at the scene of the incident, the cops immediately give their full attention to Amadou. The gendarmes show no interest in Amadou’s ethical argument; rather, they are solely concerned with efficiently managing him as the source of the trouble. The cops’ recognition of Amadou and Maria as potentially or de facto undocumented immigrants (“sans papiers”) works as an act of instantaneous capture that dispenses with any necessity of verbal interrogation. Here, language is fascistically reduced to a matter of instantaneous capture and unconscious pairings of signifiers (black young male = trouble; female homeless immigrant = trouble). Although Amadou produces an ID card, which juridically, at least, entitles him to some legal rights, he is instantly pronounced guilty and handled as a wild force that needs to be subdued (See Figure 6, below). Fidelity would entail “thinking the situation according to the event,” which in turn would “compel the subject to invent a new way of being and acting in the situation” (Badiou qtd. in Coulthard, “Negative Ethics” 72). In other words, in Badiou/Coulthard’s terms, an ethical response to the street encounter in Code Unknown would have involved acting against “consensual norms,” instead embracing “potentially restructuring, radically truthful acts” (73). Thus, just to speculate on a few of these possibilities, this ethical gesture might have taken place if the cops had listened to Amadou, if they had treated Maria in a humane way or indeed seen her as a human presence, if Amadou had talked to Maria instead of becoming righteously belligerent with Jean, if Anne had become interested in Maria and Amadou instead of being utterly consumed by Jean’s altercation with the police, and the list goes on. Although I find this line of speculation quite appealing, I don’t think the ethical force in this or other situations in Haneke’s films lies in what’s missing or could have happened, but rather precisely in the courage to leave the wound (or in Deleuze’s Bergsonian terms, the interval between stimulus and response, action and reaction) open, and the question still unanswered. This involves a slightly different ethical move than the one proposed by Badiou/Coulthard. What could have happened, but did not, submits us to a realm of transcendental possibilities that is very tempting when we are dealing with negative affects. But the key to a more immanent understanding of Haneke’s ethics resides in what Coulthard herself perceptively identifies as the “violence of inaction” (“Negative Ethics” 74) in Haneke’s films. The ethical force lies precisely in the fact that the violent action is not countered or contained by any reaction or response that might actually repair it or interrupt it. Although this is experienced as something painful or destructive, it also amounts to a political gesture or an “activism of affection” insofar as it allows the viewer to feel the full impact of the negative affect. We may even say that the lack of action in response to violence carries out a full affirmation of the negative, and this immanent gesture is the only kind of affirmation possible short of falling into transcendental wishful thinking. In a Deleuzian sense, it is less a matter of missed encounters and more one of virtual forces the film is always on the verge of actualizing: for instance, Anne and Georges never actually meet Maria, yet the film brings them together in the final scene in a virtual, yet real, sense. Maria does not always appear as an immigrant in the film, but when she does, she is stripped of her dignity and her capacity for joy and action. Whether sitting on the sidewalk as a street beggar or handcuffed and deported back to Romania, Maria is the extreme instance in the film of the notion of “bare life” theorized by Agamben. In their handling of both Amadou and Maria, the cops make clear the extent to which state power has fully and habitually incorporated the condition of a “state of exception,” in which the individual’s legal and political rights are suspended, within its political system of neoliberal democracy. As made apparent by the cops’ refusal to provide any legal justification for arresting Amadou or for dragging Maria along the sidewalk like a dog (See Figure 7. A cop drags Maria along the sidewalk), “the legal order operates only by suspending itself . . . The law is not absent . . . but it is emptied of concrete meaning and suspended in its effective application” (Oksala 33). Within this biopolitical regime, a wholly different form of language, constituted by the faciality machine and its own rigid system of overcoding, takes over from traditional models of communication. 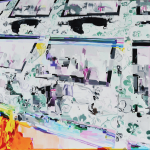 For Deleuze and Guattari, the abstract machine of faciality is aligned with “a generalized collapse of all of the heterogeneous, polyvocal, primitive semiotics in favor of a semiotic of signifiance and subjectification” (180). As Code Unknown shows, the faciality machine cancels out any possibility of the exercise of language as a mechanism of either representational efficacy or rhetorical persuasion. This is absolutely made evident in Amadou’s vain attempts to use language to rationalize the violence that has erupted between him and Jean. The faciality machine works as a social production of faces, and, as such, it obliterates any possibility of independence between the face and language. In other words, the face is no more able to carry an autonomous expression independently from language than language is able to serve as a conduit for transparent communication (179). 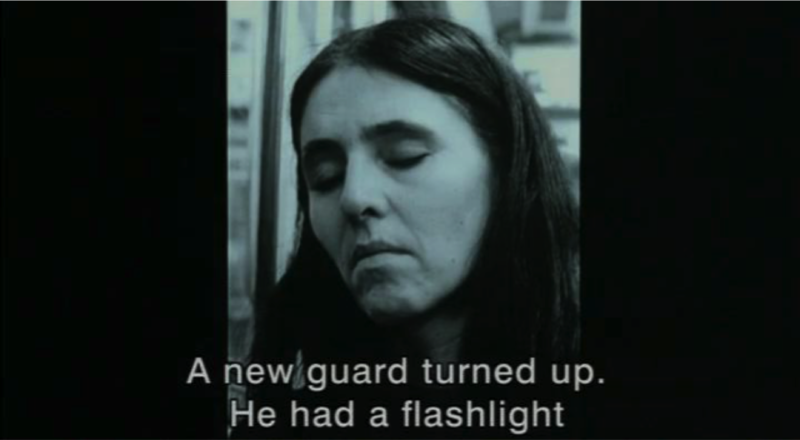 Another resonant example in the film of the deployment of faciality as a mechanism of biopolitical capture occurs in the segment showing a series of black and white pictures of people’s faces that Georges has taken in the subway unbeknownst to any of the subjects photographed. Besides the obvious violence inherent in Georges’s act of invisible capture, which alludes to our unwitting daily capture by a host of intangible, unlocalized surveillance mechanisms around us, one of the things this series of pictures makes clear is that the contemporary makeup of the French population lies far beyond any illusions of a homogeneous national identity predicated upon a single race or ethnicity. The multiracial composition expressed in this series of photographs evokes a heterogeneous mapping of the French nation as both a war machine that resists the nationalistic fight for a nostalgic maintenance of self-identity and as a target of the fascist/repressive faciality machine that instantly pronounces non-white faces as deviant (See Figures 8, 9 and 10). Such a multiracial, non-Eurocentric array of faces forcefully contradicts the idea of French national identity, one that Code Unknown generally identifies with the aims of the European Union to maintain a semblance of economic and political unity in the face of increasing flows of immigrant labor crossing its borders. As Janell Watson has argued, although identity in some instances “serve[s] a positive political function in minority struggles against majority oppression” (198), the “focus on European identity may be a way to avoid talking about not only lingering racist and ethnocentric discrimination, but also and especially about access to the resources which states confer according to citizenship-based hierarchies” (198). The new exclusionary policies the European states utilize to ensure their own identity against foreign or dangerous bodies are not only based on color or ethnicity, but, in conjunction with these visible markers, identity depends on “the juridical categories of citizenship, legalized residency status and work permits” (211). We can identify this bureaucratized level of overcoding as one of the most harmful forms of violence inherent in biopolitics. Unlike the violence of previous forms of sovereignty in disciplinary societies, the violence that biopower gives rise to in today’s control societies of globalized capitalism is neither obviously physical nor, in most cases, spectacularly visible. Moreover, the violent effects of biopower are somewhat masked by its life-preserving goals. In no way, however, do these goals entail a lessening of the powers of subjugation brought down upon the body, but simply a reterritorialization of both the forms of power and their effects. In neoliberal capitalist states, the reterritorialization of power is inextricably connected with the commonly accepted equation of the forces of life with the forces of the market, a system “in which everything has an equivalence in money” (Adkins 162), and it is this equivalence that produces the most insidious form of subjugation. This silent and generalized subjugation of bodies based on our abilities to invest, or be invested by, capital is complemented by the intensified violence that occurs on a second discriminatory or exclusionary level. Here, violence weighs disproportionately on the bodies of those whose capacities for production and consumption are negligible. If persons themselves are no longer marked by power, but only their labor capacities as quantities of surplus value (Adkins 163), those whose labor capacities do not yield surplus value will be branded as superfluous, or even dangerous to the life-enhancing, capital-enhancing, goals of biopower. Violence in control societies is exercised through invisible and dispersed vectors of control built into the flows of production and consumption in seamless, almost imperceptible ways. Sovereign power today is thus as abstract and elusive as the flows of capital and the speculative forces of global markets. Although, as we see in Code Unknown, there are exceptions to this invisible exercise of violence (as when the police, for example, deport a handcuffed Maria back to Romania, or when they subdue a resisting Amadou), in most cases the violent force is not borne upon the body directly, but through indirect means. As in Maria’s case, the flow of immigrant labor is subjected to administrative regulations and procedures which impose a form of violence that is as much economic as it is affective, for the person’s inability to enjoy a decent livelihood and to meet the bare necessities of life gives rise to a full range of self-debasing feelings. The scene in Code Unknown where Maria shares her worries with a fellow Romanian immigrant over her lack of a work permit is a good gauge of the kind of violent effects produced by biopower. In this scene, we surmise that Maria is in a house she shares with a group of Eastern European immigrants in Paris. At one point, she walks away from her friends into a nearby room. She leans on the wall, and stooping down on the floor, she covers her face with her hands and starts to cry. A woman asks her if she is sick. Maria explains that a Romanian friend had promised to pass along her license to sell newspapers, yet somehow has failed to deliver on her promise. She cannot apply for a license herself because she was deported a few months ago. But after bringing up the crucial importance of work permits, the scene insightfully proceeds to touch on the deleterious affective consequences of these regulatory mechanisms. Implying the mutability of power relations, Maria tells her friend how disgusted she herself had once felt upon giving some money to a dirty gypsy beggar. But then she turns the tables on her disgusting encounter with the beggar by referring to her own begging experience on the Boulevard Saint-Germain: “A man was about to give me 20 francs. But when he saw my outstretched hand, he threw the bill into my lap as if I nauseated him. I rushed back here and hid myself in the attic. I cried my eyes out all day.” Maria’s body language during the entire scene recalls the gestural performance of the young girl in the film’s opening moments. In both instances, the body insists on its own disappearance by adopting gestures of hiding and withdrawal. These gestures of self-cancellation whereby the subject herself, with no need for overt physical force, comes to assume her own virtual death show the ease with which biopower carries out its discerning selection of useful and useless lives, and the horrific violence behind such ease. In other words, the state abandons certain concrete lives in the interest of preserving not so much many other lives as a generalized ideal of life that is wholly abstracted in its equivalence with capital. The subject abandoned by the state intuitively understands that her life is not as valuable as the life that lends itself to this equivalence. And yet, despite the dismal implications of this scene, it should be said that it is precisely in drawing attention to Maria’s performance of self-erasure and to the enormity of the affects it involves that the film opens up a path towards ethical resistance. Code Unknown resists by making visible the process of capital’s reduction of the person to surplus value, and in making such process visible, it attests to the possibility of dismantling the mechanisms of knowledge and power complicit with this process. As a system of inclusion based upon exclusion—a production of identity dependent upon the negation and repression of difference—the effects of biopower are detrimental to both excluded and included alike. The subway scene, where Anne is unremittingly harassed by a young Arab man (or beur), sheds light on the ways in which the disaffection of the marginalized breeds a violence that cannot be contained at the margins, but spills over into the public spaces shared by all. The scene in the subway illustrates the utter ineffectuality of either the regime of social stratification or the causality-governed rationalizations of representation in containing violence. Suddenly and unaccountably, the violence pushed to the margins by the law bears down on those who are “included” and favored by the system. Inside the subway car, the young beur stands beyond the right edge of the screen and harasses Anne with his gaze directly and relentlessly trained on her body (See Figure 11, below. Anne is harassed by the young beur, who stands beyond the right edge of the screen). As we can see in the faces of those occupying the space of the frame, the out-of-frame presence of the Arab man sends ripples of violent tension into the faces and bodies of those we do see, thus making clear that his exclusion from the visible in no way diminishes the violence of its affective demands on both characters and viewers, if anything increasing our tension precisely due to our lack of access to the space beyond the visible. 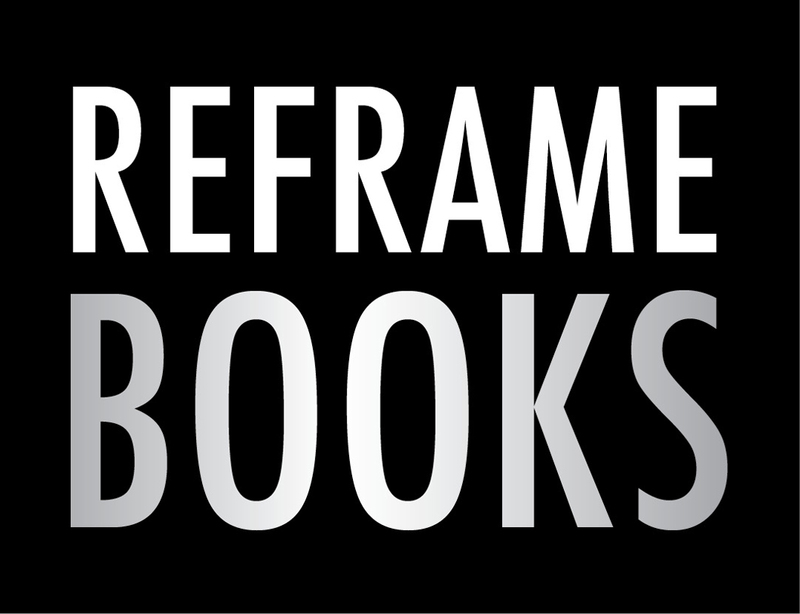 These in-frame and out-of-frame dynamics not only expose the futility of biopower’s efforts to manage life through the binary of inclusion/exclusion, but they also point more generally to the way the self is constituted by the other, the in-frame by the out-of-frame, the actual by the virtual. Code Unknown makes clear that the fluidity of the current geopolitical and economic realities makes the entrenched insistence on nationalistic identities and economic hierarchies both unsustainable and highly detrimental to the well-being not only of those who are excluded but also those who receive full privileges of inclusion and citizenship. Moreover, Code Unknown submits the regime of faciality and its overcoding of persons to a critique that exposes its own mechanisms as arbitrary and mutable. Just as the cultural judgments associated with the relations between certain faces and their socioeconomic functions are purely capricious and volatile, we can say that identity, whether of the individual or the nation-state, is purely a myth created to consolidate an elusive sense of unity or homogeneity. As Code Unknown illustrates by contrasting the denigrated Maria in the streets of Paris with the Maria who dances and rejoices at the wedding celebration in Romania, or by juxtaposing the scene of Amadou’s confrontation with the police with the pleasant conversation he shares with his girlfriend at the restaurant, there is no such thing as identity, let alone an inherently or essentially violent identity. There are only multiple becomings of the subject, which are wholly dependent upon the variable field of forces in which we are situated—forces in relation to which we can either be diminished in our capacity to act, feel, or create, or augmented in those very capacities. One of the scenes where Anne is acting out a dramatic part uniquely illuminates the idea that socioeconomic positioning or identity is consistently trumped by the volatile, arbitrary designs of biopower. Here, she plays a wealthy woman who is being shown a spacious, luxurious apartment by a realtor. Suddenly, she finds herself trapped and confronting a sure death in a windowless red room. The importance of this moment lies in the forceful way it extends the state of bare life to any and all bodies in the film, regardless of race or socioeconomic status. This scene announces itself as viscerally affective rather than representational. The intrusive, relentless training of the camera on Anne’s face suggests a desire to dismantle the real/fictional divide by piercing through her first layer as fictional character/actor and into the real affects beneath this mask. A voice-off, supposedly the diegetic director’s (Didier Flamand), takes on the lines of Anne’s sadistic captor. As the male voice-over says, “The door is locked, you will never get out, you will die here,” Anne’s facial expression of disbelief and the panicky tone of her voice (“Sorry, is this a joke?”) are so utterly convincing that the man’s words are no longer part of a script (See Figure 12, below). When, at last, Anne asks the man, “What do I have to do?” he replies, “Show me your true face. Not your lies nor your tricks. A true expression. Be spontaneous, react to what’s happening.” The man’s instructions strongly evoke the kind of acting cues and demands a film director would give to his/her actors. The allusions to a “true face” and “a true expression” also resonate with the film’s sense of urgency, mentioned earlier, for a new code of affective exchange that might differ from the worn out and empty linguistic formalities and epistemological tricks of past models of communication. This scene thus unfolds in an indeterminate, exceedingly evocative, affective-performative space that has let go of its ties to realism in order to resonate affectively with the rest of the film. Anne’s violent exposure in the void of her fear as she faces annihilation recalls Georges’s father’s attempt to hide his own powerlessness from others, Georges’s well-practiced routine of dodging conflict, Maria’s painful confrontation of her own dehumanized image reflected in the faces of others, and Amadou’s humiliating confrontations with police forces. All characters in Code Unknown are, in varying ways and degrees, trapped by a multitude of stratifying forces, captured by extreme affects, and in search of a true expression that will resist the forces that hold them captive. Thus, it would be disingenuous to think that Anne’s status as a French citizen and an actor affords her the privilege of representing bare life as opposed to becoming it. As we see in the red room scene, the privilege of representational distance is all but erased, and this lack of distance functions precisely as an index of how far bare life can reach: in the world of Code Unknown, it is no longer restricted to immigrants, but extended to all. The segregations and classifications set up by the biopolitical machinery are thus challenged by an affective stream that runs unstoppably and indiscriminately throughout the film and exposes the connectivity underlying superficial distinctions. With a chaotic, yet affectively coherent, script and a camera that turns the image into a trance, the film recirculates affects from the technocracies of biopolitics, from the mechanisms of knowledge and power that manufacture and validate the general ideas that circulate in our society. Code Unknown thus appropriately ends on a note of unbreakable affective continuity that defies all causality as well as linguistic understanding. 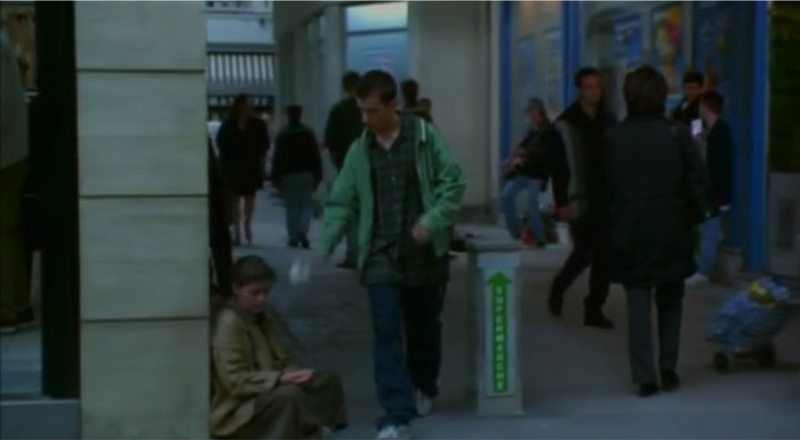 In a tracking shot that covers the space of the sidewalk outside Anne’s apartment, the last scene injects a sense of virtual connectivity into Anne, Georges, and Maria’s lives of which they themselves remain absolutely unaware. 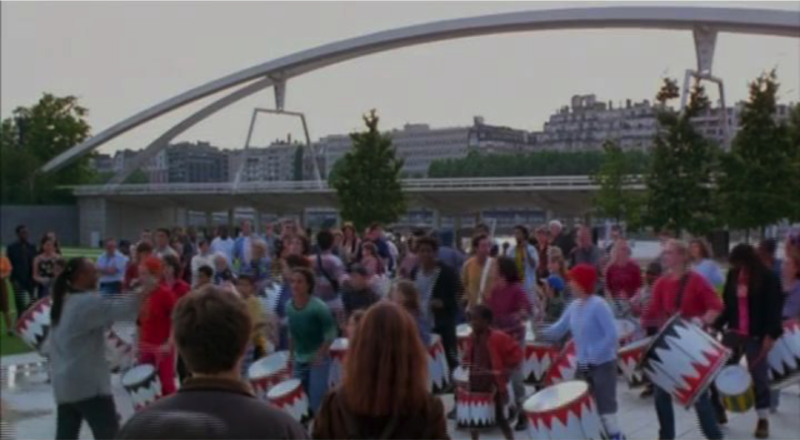 Right after the scene in the subway, a large group of children, apparently the same hearing-impaired children from the opening scene, are seen playing drums by a modern bridge structure (See Figure 13, below). The loud, urgent sound of their drums is heard over the remainder of the film’s images, drowning out all other sounds. 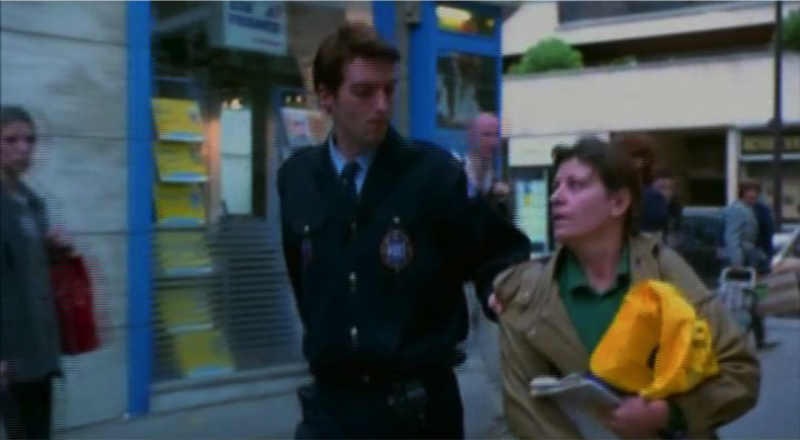 Images of Maria looking for a begging spot and being removed from it by a salesperson are followed by images of Anne exiting the subway station and walking home. The sound of the drums continues unabated as Georges punches in the code into Anne’s buzzer only to realize that she won’t let him in. As if evoking a massive, uncontainable force relentlessly marching on, the drums lend an enormous affective resonance to the film’s ending. The sense of the images we see can no longer be comprehended through verbal exchanges. At best, language has become a cliché, at worst, an unconscious channel for the violence of biopower. In place of language, the sound of the drums vibrates with all the violence heretofore disclosed by the film, yet it does not try in vain to counter it or quell it down. It is primarily in this way that Code Unknown embraces a truly resistant politics—by branding the awesome violence it registers in the world directly upon our brains. Adkins, Brent. Death and Desire in Hegel, Heidegger and Deleuze. Edinburgh: Edinburgh UP, 2007. Print. Agamben, Giorgio. Homo Sacer: Sovereign Power and Bare Life. Stanford: Stanford UP, 1998. Print. —. Means without End: Notes on Politics. Trans. V. Binetti and C. Casarino. Minneapolis: U of Minnesota P, 2000. Print. Coulthard, Lisa. “Interrogating the Obscene: Extremism and Michael Haneke.” The New Extremism in Cinema: From France to Europe. Eds. Tanya Horeck and Tina Kendall. Edinburgh: Edinburgh UP, 2011. 180-91. Print. —. “Negative Ethics: The Missed Event in the French Films of Michael Haneke.” Studies in French Cinema 11.1 (2011): 71-82. Print. Deleuze, Gilles. Cinema 2: The Time-Image. Trans. Hugh Tomlinson and Robert Galeta. Minneapolis: U of Minnesota P, 1989. Print. —. Foucault. New York: Continuum, 2006. Print. —. “Postscript on the Societies of Control.” October 59 (1992): 3-7. Print. Deleuze, Gilles, and Félix Guattari. A Thousand Plateaus: Capitalism and Schizophrenia. Trans. Brian Massumi. Minneapolis: U of Minnesota P, 1987. Print. —, and Claire Parnet. Dialogues. Trans. Hugh Tomlinson and Barbara Habberjam. New York: Columbia UP, 2007. Print. Oksala, Johanna. “Violence and the Biopolitics of Modernity.” Foucault Studies 10 (2010): 23-43. Print. Patton, Paul. “Activism, Philosophy and Actuality in Deleuze and Foucault.” Deleuze and Political Activism. Ed. Marcelo Svirsky. Deleuze Studies 4 (2010): 84-103. Print. Shaviro, Steven. Post-Cinematic Affect. Winchester: Zero Books, 2010. Print. Watson, Janell. “Theorizing European Ethnic Politics with Deleuze and Guattari.” Deleuze and Politics. Eds. Ian Buchanan and Nicholas Thoburn. Edinburgh: Edinburgh UP, 2008. 196-217. Print. Excerpt from The Grace of Destruction: A Vital Ethology of Extreme Cinemas by Elena del Río (forthcoming 2016) is reprinted with permission of Bloomsbury Academic. In his “Postscript on the Societies of Control,” Deleuze develops and updates the idea of social control beyond the disciplinary regime theorized by Foucault. In control societies, visible forms of confinement or punishment are no longer prioritized as mechanisms of subjection. Instead, through its ubiquitous expansion, capitalism exercises control by turning every manifestation of human consciousness or activity into surplus-value, and by instituting a system of perpetual assessment, training and education that continues throughout life. Under the socioeconomic requirements of constant modulation and metastability, the individual becomes a “dividual,” a concept that breaks down the classical distinction between mass and individual, and points to the function of the subject in terms of abstract marketing data and informational codes that serve the accumulative ends of capitalism. Georges’s father’s desperate gesture of killing his own cattle resonates with the socioeconomic plight of farmers in certain European countries. As one of the editors in this volume pointed out to me, this part of the plot links directly with constant media attention to their frequent demonstrations, their deliberate waste of their own produce as gestures of protest against subsidies, free trade, and so on. In Homo Sacer: Sovereign Power and Bare Life, Agamben uses this term in the context of the Nazi extermination of the Jews. However, the concept of “bare life” can be extended to include the abstraction and objectification of life that occurs within today’s control societies as well. As Agamben notes, we may look at the camp and its organization of life as expendable matter not as a historical anomaly, but “as the hidden matrix and nomos of the political space in which we still live” (Means without End 37). The biopolitical designation of life as “bare life” thus takes place whenever living beings are subjected to the explicit calculations made by the sovereign regimes of knowledge and power. For Deleuze, the transformation of the individual into a dividual also marks a transformation of modalities of control. The dividual is no longer an individuated subject, but a conglomerate of coded matter. In this new regime, “what is important is no longer either a signature or a number, but a code . . . [or] password . . . The numerical language of control is made of codes that mark access to information or reject it” (“Postscript” 5).